I love lists and favorites, so I’m going to share a few which have caught my eye now in January. Are you a subscriber to my newsletter? There will be a few favorites in there which aren’t in this post, along with other content (and giveaways! ), so sign up now! I’m also on Twitter @rosso. Favorite on-the-go snack: Endurance crackers. I’ve made these a few times – all seeds. Really. No extra binding needed other than water, and spreading them very, very thin gives you a great cracker. via Oh She Glows. Favorite me time: Painting nails. Grey nail polish from O.P.I. at Sephora. I’m discovering the pleasure of doing my own fingernails after years of going without. Reds and grays. Favorite dance break: Dance like Nobody’s Watching. It’s no secret that I love to dance (at least, I haven’t been keeping it purposefully from you). When I come back from the gym, I’m still blasting my workout music, and rather than being tired, I usually have a burst of energy that I let out in an impromptu dance party in the elevator. Though I live on the 7th floor, it’s never long enough. I like this series, Dance like Nobody’s Watching. I may put my own contribution together. Dance like nobody’s watching – love this dance, love this song. And I love the smiling – people should be having fun while they dance! And now I have a girl crush on her, too. Via Carrie Loves. Favorite Comfort Food Resource: Soup Chick. I love, love, love soups, and since I’ve gotten comfortable whipping up homemade stock (see my recent mixed legumes soup and chicken stock recipes), I love making soup at least once a week. I usually make it last for 2 or more meals and each meal I add a new ingredient so it’s a slightly different soup. Lydia has been blogging for a long time…and I couldn’t but help love a blog dedicated to just soups. 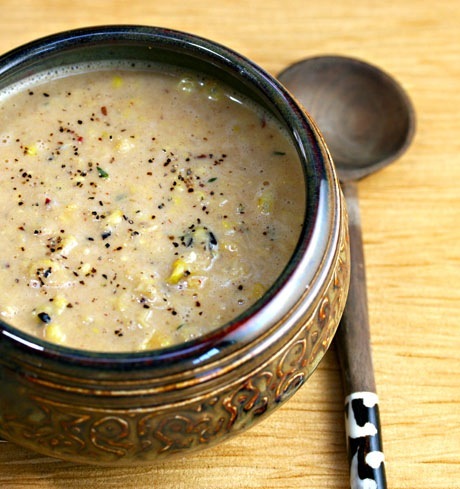 Pictured: Corn chowder with chipotle cream. Check out the long list (and growing) of Soups by Name. 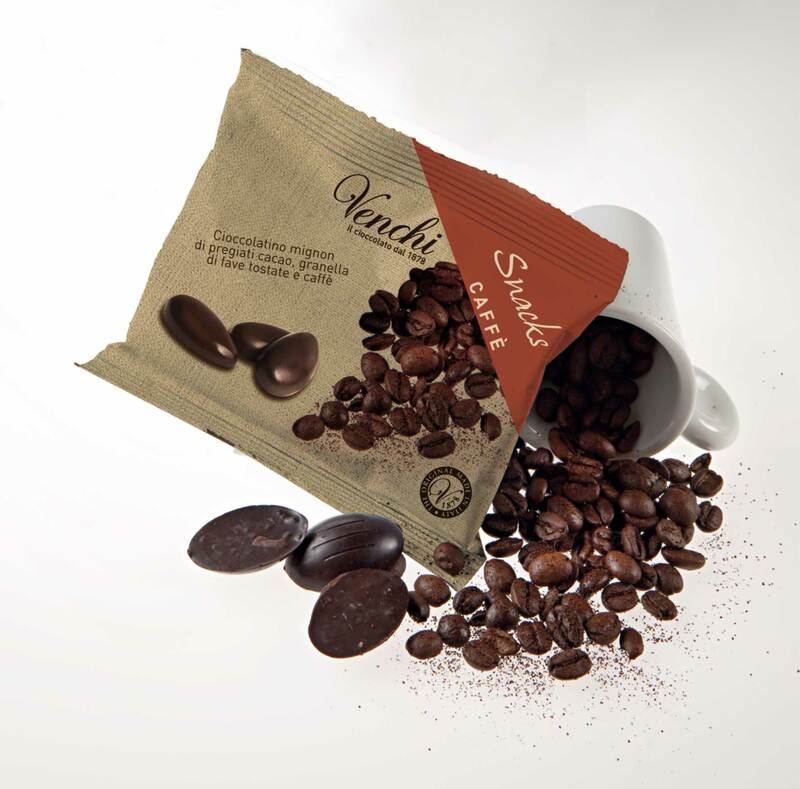 Favorite indulgent snack: Venchi caffe snack. Coffee + chocolate? Yes! Honestly, I think chocolate-covered coffee beans are too much. That’s why I was pleased to find Venchi’s new snack – super dark chocolate (I think 75% but of course now I’ve thrown the package away), roasted cacao nibs, and tiny pieces of coffee beans, too. Indulgent and just the right balance of coffee + chocolate. So far they aren’t sold online, so you’ll have to find a Venchi store to get some. My favorite is at departures at Malpensa airport – I always pick up a little something there. My backup choice is the Chocaviar (available online). Favorite Project: Apartment Therapy’s January Cure – Get organized and get motivated – a new task and focus every day. Could be started on any month! Dim Sum. There are few places to get dim sum here in Milan, but I think it will continue to grow. In the meantime, I’ll relish the lessons I got in dim sum from my colleagues at HP. 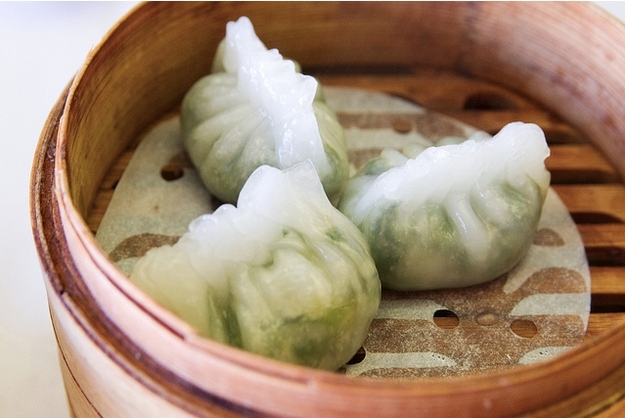 The Essential Guide to Dim Sum is a great introduction. And did you know McSweeney’s does a food journal called Lucky Peach? The writer of the guide contributes there, too. Favorite healthy trend (for now): Juicing. Everyone’s discovered it – the interblogs are literally exploding with juicing posts. I won’t be doing one here (I think juicing is a tool, but it’s not a cure), but I couldn’t resist Heidi’s post about a lesson in juicing. Her juices are beautiful. Favorite How-To: How to Make Chocolate Bars. David takes you through how to make custom chocolate bars to wow your friends, and shares a secret about avoiding the dreaded tempering! Favorite grinder: Garlic and salt. This isn’t your powdered garlic salt from the 1980s. This is raw and real dehydrated California garlic and rock salt. I might actually be addicted to this – I’m finishing my second grinder with a third on the way. And the garlic is from California, so I’m a bit partial. Grind your own! Disclosure: No compensation was provided for any of these mentions. I’m glad to see that someone else’s soups morph into a different soup the 2nd or 3rd time around. It’s almost like having sourdough starter in the frig. I’m going to try the crackers for sure. Thanks for the chocolate tips–one more thing to look for in Italy!